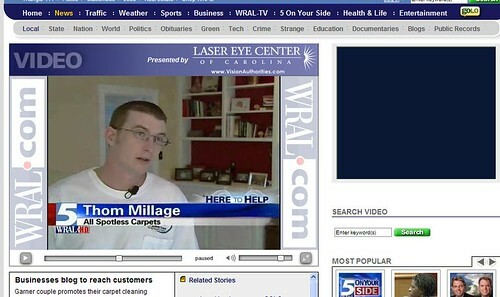 MerchantCircle member Thom Millage of All Spotless Carpets was featured today on primetime news in the Raleigh-Durham area of North Carolina. For WRAL's "Here to Help" segment, Thom spoke of saving over $10,000 a year by leaving print advertising and the benefits he's seen from blogging and utilizing online networks, such as MerchantCircle! Check out the video by clicking on WRAL's site here. More and more small businesses are saving marketing dollars by turning to the Internet to find customers. They use blogs and Web sites as a cheaper alternative to expensive listings in the phone book or advertisements in the newspaper or on television. Thom and Joni Millage, the husband-wife team behind Garner's All Spotless Carpets, cut their print advertising and turned to MerchantCircle.com, a site that offers tools to help small businesses build a Web brand and be found by online searches. The couple began All Spotless Carpets in 2002. "We started out the traditional way, with the Yellow Pages," Thom Millage said. You can read the entire version here, but I recommend watching the story! Great post Kevin! This definitely highlights that there are less expensive ways to promote your business than using traditional print advertising. As you have pointed out, so much business is being conducted on the internet these days and at a lower cost than most other advertising mediums. Blogging is a great way to build trust and credibility over a period of time. The more prospective customers know about you and your business, and the more you demonstrate in-depth knowledge about the service or product you are offering, the more they feel comfortable doing business with you. I am new to Merchant Circle but it seems like a great way to promote your business for free. DO NOT CUT YOUR TROAT BY LEAVING ALL YOUR YELLOW PAGES PRINT ADVERTISING! Sure it sounds like a fantastic idea to leave all your Print Advertising but you are cutting your throat if you do! I have been a Successful Small Business owner for over 28 years, with a Retail and Service business both, the one thing you do not, DO NOT do , is cut your ADVERTISING budget during Economic Downturns! Especially your Yellow Page Directories, which is the least expensive medium for your money. You must stay in all of your books in your area by budgeting out a certain amount per book. I don't recommend putting all your Eggs in one Basket in One Yellow Page Directory, Or One News Paper, or One Internet Search Engine, you must be in all to Penetrate your Market! Not everyone uses the Internet, Not everyone uses the Yellow Pages, not everyone uses the Newspapers, not everyone uses the Television! Do you see what I am trying to convey? You must forcast a budget to be in all Media Areas to be successful in this market. You must make COLD CALLS, You must Network, you must Market your business 100%! SO don't believe that the Internet is the ANSWER TO ALL YOUR PROBLEMS! Because it is not! You must be smart and track your phone calls by asking how did that client find about you? And go more in detail by asking Which Phone directory? Is it the Valley Yellow Pages or ATT? Ask what the color of the book is to get a full accurate count! Not everyone drinks Pepsi because drink Coke? So why would you put all your stocks into Pepsi , when you know that people drink Coke? Smart Businesses market themselves in all Media Forums. Businesses that increased their Advertising during economic recessions and depressions grew their business by 273%, Businesses that downsized their advertising grew their business by only 19%, Businesses that cut advertising completely, went out of business! This is true and experienced this in my career in the 80's,90's and 2000's recession and always increased my advertising. People, don't cut your Yellow Page budget, stay in their I promise you want people to know you are still in business! I am a Merchantcircle member for 2 years and I do love my internet service program from Merchant Circle but I do not put all my eggs in one basket as a Business person! People I wish you all the success out their, I do consult businesses in marketing everyday and understand the hardships business owners are facing today because I am one of you and I have experienced it and succeeded!!!!!!!!!!!!! DO NOT FOCUS ON NEGATIVITY! FOCUS ON YOUR GOALS AND WANTS!